A basin wrench is a specialty plumbing tool that nearly all professional plumbers own—and one that every homeowner who does DIY plumbing work should own. The tool is designed to do only one thing—to install or remove a faucet—but it does that one thing better than any other tool. Once you understand how to use it, it will become an indispensable part of your plumbing tool kit. Kitchen and bathroom sink faucets typically are secured with low-profile mounting nuts that are accessible only on the underside of the sink, behind the basin. Standard wrenches and pliers are almost useless in this situation: Enter the basin wrench. A basin wrench has a pivoting gripping head that sits at the end of a long handle, and it is designed to reach up into that awkward, inaccessible space behind a sink to tighten or loosen the mounting nuts on a faucet or the flexible supply tube nuts that connect to the end of the faucet tailpieces. These nuts are so difficult to reach that some plumbers prefer to attach the faucet to the sink or countertop before setting the sink or countertop into place. Where this isn't possible, though, the basin wrench lets you reach up behind the sink from underneath, grip the mounting nuts, and tighten or loosen them easily. The tool has a long shaft and a small, spring-loaded, claw head that tightens onto the nut as you turn the shaft. The head swiveled 180 degrees in either direction to set it up for loosening or tightening nuts. At the bottom end of the shaft is a sliding T-bar that provides leverage for turning the shaft. Because it is designed only for use on faucet mounting nuts, a basin wrench's uses are limited. But from time to time every homeowner faces faucet replacement, and when you need one, a basin wrench will prove to be the best $10 or $20 you ever spent. Here is how to correctly use a basin wrench. To loosen the nut, you will turn the wrench counterclockwise, and the opening of the claw on the head should be on the right (as shown in the left photo here). To tighten the nut, you will turn the wrench clockwise, and the opening of the claw should be at the left (as shown in the right photo here). Remember, turning clockwise tightens; turning counterclockwise loosen. Or, if you prefer: righty-tighty, lefty-loosey. Also, remember that you're looking at the nut from the perspective of looking up at it from under the sink—not from the top looking down. You'll know that you've positioned the head correctly if the claw grips the nut as you turn the wrench in the desired direction. If you get it backwards, the claw will slip off the nut immediately. Fit the head of the wrench around the faucet mounting nut so the ridged jaws of the claw grip the notches or edges of the nut. (In the photo here, the head is positioned for loosening the nut.) 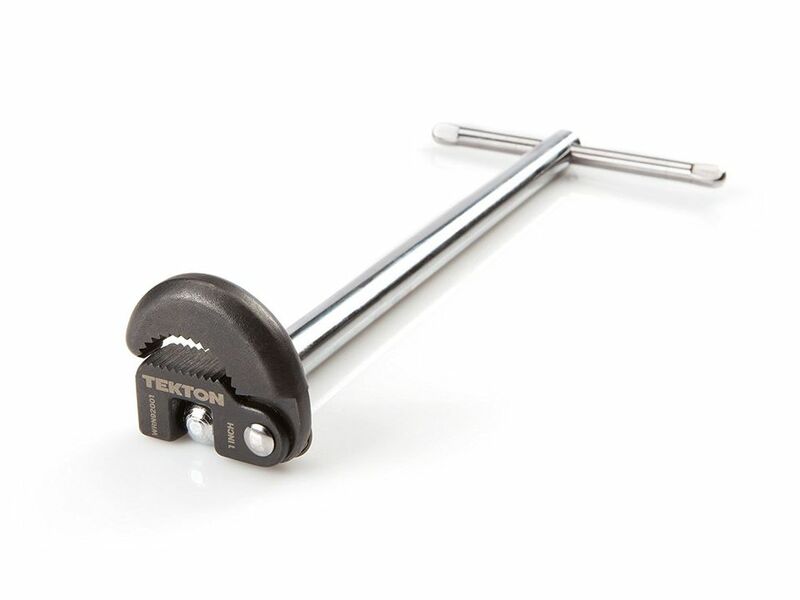 Use the T-bar at the end of the basin wrench to turn the shaft and loosen or tighten the nut. You may have to use two hands on the T-bar, or you can slide the bar all the way to one side and lever it with one hand while stabilizing the wrench shaft with the other hand. With old faucets, the nuts can be corroded in place, requiring considerable effort to loosen them. You can sometimes make this easier by spraying penetrating oil on them and waiting a few minutes before attempting to loosen the nuts. A telescopic basin wrench (left photo) has an extendable shaft to reach faucets with really deep sink basins. Use a pipe or the back end of an adjustable wrench to increase your leverage on a T-bar (right photo) for removing stubborn nuts. There's no need for this kind of leverage when tightening a nut. The claw can grab a nut from any position around the nut (just like pliers can), so move the head to any position that's comfortable for turning the wrench.